Charlie feels at home in libraries, and hopes that students will too. Why did you choose to work at George School? This is a school with excellent teachers who really care about each and every student. Both of my children and my father graduated from George School. With me it skipped a generation. But I wanted to give back to the school and started as a volunteer helping the archivist, and now I proctor evening Study Hall. Why do you enjoy supervising Study Hall? I enjoy it because I like getting to know George School students, learning of their experiences, aspirations, and dreams. They are our future. I would recommend One Day in the Life of Ivan Denisovich by Aleksandr Solzhenitsyn. It is short enough for a busy George School student to read in one sitting and is a wonderful model of storytelling through apparently simple description. Charlie studied biology at Swarthmore College, and has a master’s in public horticulture administration from the University of Delaware. For many years, Charlie was the historical horticulturist for the living history museum Pennsbury Manor. 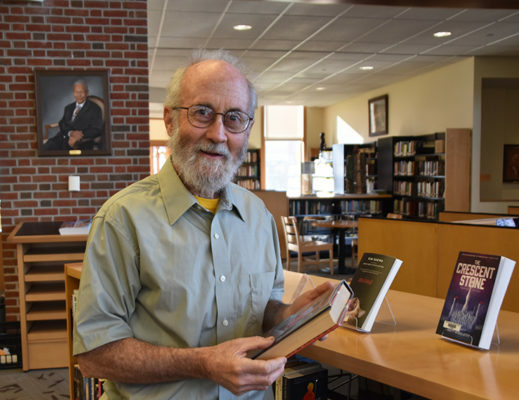 He has also worked in the Bucks County Free Library system since 2011. Charlie, who grew up in Rome, Italy, frequently travels to his home in Cortona.